For the most part, Spain's many attractions are free or cost very little. Madrid, situated almost squarely in the center of the country, is a good starting point to enjoy the multitude of historic sites, natural landscapes and quiet villages found in every region. The Puerta del Sol, Madrid's major crossroads is named for an early town gate that has since disappeared. 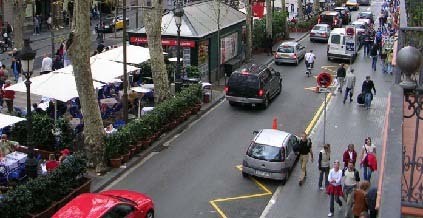 Traffic flows along ten intersecting streets, six of which lead into roads that extend to the country's frontiers. Not far away, royalty once staged bullfights and ceremonial events in the Plaza Mayor. Today pleasant arcaded shops and cafes fill its vast expanse. To view the art of the Prado Museum, an old and comprehensive picture gallery, takes weeks. 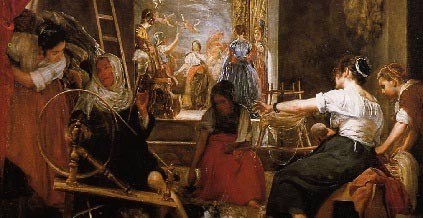 Sought-out collections include those of the Spanish painters, especially Velasquez and Goya. Masters from other countries are also represented. Two more landmarks worth visiting are the Plaza de Espana with its Cervantes Monument depicting Don Quixote and Sancho Panza, and the IBOO-room Royal Palace, now used by King Don Carlos on state occasions. A few miles northwest of Madrid lies the austere Royal Monastery of El Escorial, granite burial place of kings and queens of Spain. Nearby the former chief-of-state Generalissimo Francisco Franco is interred at the Valley of the Fallen Monument, dedicated to the victims of the Spanish Civil War. 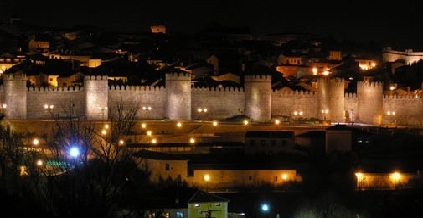 Avila's single most memorable sight is its medieval walls incorporating eighty-eight towers and several gates. Depending on the time of day, these perfectly preserved fortifications change from golden grey to deep purple. The Roman aqueduct of Segovia, constructed eighteen hundred years ago of granite blocks without mortar, still transports water to the town from nearby mountain springs. Twin filagreed towers dominate the ornately ornamented facade of the Gothic cathedral of Burgos. In the interior Ruy Diaz, the chivalrous mercenary immortalized in The Poem of El Cid, and his wife Ximena lie interred beneath the dome. Two cities front the Bay of Biscay: Santander, site of an international music festival, and Guernica, famous for its destruction in the Civil War. A highlight of Barcelona is the Gothic Quarter, a warren of narrow streets and old churches. Kings of Aragon once ruled from a palace on the site of the Plaza del Rey. Nineteenth-century architect Antonio Gaudi and his followers designed many fantastic buildings in the neo-Catalan style. Construction on the complex Church of the Sacred Family, begun in 1882, is still underway. Book stalls and well-known landmarks line the Ramblas, a succession of colorful avenues running from the waterfront to Barcelona's center. While pedestrians stroll down the tree shaded middle section, traffic roars by on either side. The Museum of Modern Art offers an overview of Catalan painting and sculpture, including works by Dalí and Miró. The sole purpose of the Pablo Picasso Museum is the promulgation of the art of the versatile Malagueño. Ninety miles off the coast of Catalonia lie the four Balearics, each island different from the others. Mallorca, Minorca, Ibiza and Formentera have in common white-sand beaches and blue Mediterranean seas. Fertile orange groves and rice paddies of La Huerta encircle modern Valencia; hotels and restaurants lend life to the Plaza de Caudillo at the city's center. Pottery from many places and eras, with emphasis on work from Valencia and environs, is on display in the National Museum of Ceramics. Beyond Valencia appear the lime-washed houses of the southern Mediterranean coast. Guaranteed year-round sunshine attracts more vacationers to the Costa del Sol than to any other area in Spain. International socialites and movie stars find repose in chic Marbella. The character of old Spain is retained in the side streets and cobbled plazas of Málaga. Ancient fortifications on the elevated Gibralfaro offer a magnificent view, on some days as far down the coast as Gibraltar. The Alhambra of Granada, palace of sultans and their harems, displays the honeycombed wood and stucco decorations of Moorish artisans. 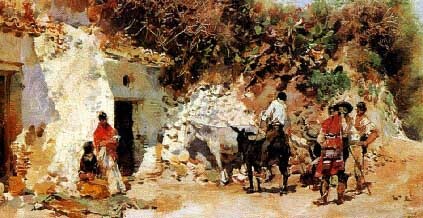 Gypsies still perform flamenco dances in mansionlike caves situated high on the hill of the Sacromonte. Two monuments of Seville are only steps apart: an art-filled cathedral commissioned with the gold of the New World, and the Giralda, a minaret topped with a Christian bell chamber. Narrow streets and flower bedecked patios retain Córdoba's Moorish air. Not far from La Mezquita Cathedral, once the principal mosque in the western world, winding lanes intertwine with plazas and squares to form the maze of the old Jewish Quarter. Gothic and Moorish walls ring Toledo's innumerable treasures of art and architecture. 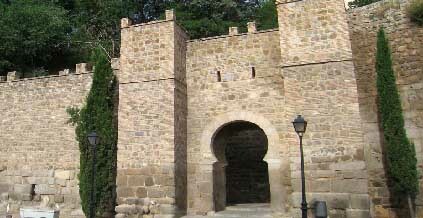 The Alcázar, reconstructed after its destruction in the Civil War, displays many grim reminders of the siege waged between Republican and Nationalist armies. Among the priceless religious objects stored in the cathedral of Toledo, both a Gothic church and a museum, is a vessel fashioned from 500 pounds of gold. Every day, as for hundreds of years, Mozarabic families attend a mass celebrated in the Visigothic manner.